as a standardised extract Providing 3% Rosavins per 2 tablets. Rhodiola Rosea, also known as Golden root or Roseroot, is one of 50 different species of rhodiola and it is this species that is both widely used and trusted, with a long tradition of use. Rhodiola Rosea is thought to contain a variety of potentially active compounds, the most talked about being the rosavins. 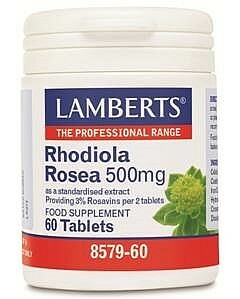 Lamberts® Rhodiola Rosea extract is equivalent to 500mg of Rhodiola Rosea with a guaranteed level of 3% rosavins per 2 tablets. Tablet Coating (Colours: Titanium Dioxide Iron Oxides & Copper Chlorophyllin Hydroxypropyl Methylcellulose) Crosslinked Cellulose Gum Silicon Dioxide Magnesium Stearate. See Presentation Section for Ingredients listed in BoldThis product is free from wheat, yeast, dairy, soya, nuts, shellfish and Gluten containing ingredients. This product is not recommended for pregnant or lactating women. This product is suitable for all adults.